With zoning laws like these, who needs wars? Beirut’s traditional Ottoman-style mansions are being razed in favor of high rises that can be sold as having an ocean view. People can sell these ancestral homes with their glorious oasis-like gardens to developers because there is not a single law on the books protecting properties younger than 300 years old. Evidentally there aren’t any basic zoning laws either, or else there’s no way they’d be allowed to strip the city bare of 2 and 3-story homes and replace them with 20-story towers. The only law on the books that protects old homes in Lebanon dates back to 1933 when the country was under French mandate. It mainly protects buildings constructed before 1700 although younger buildings can be placed on the list of protected sites either by government directive or private initiative. “The law basically focuses on the protection of archaeology and antiquities,” Culture Minister Tarek Mitri told AFP. A survey commissioned by the government in 1997 identified about 250 buildings in Beirut that cannot be demolished. The list is of little consolation to activists like Hallak, who say the issue is more about preserving the country’s heritage than merely saving a building or a mansion. “It’s important to save an entire street, what we call a cluster… there is a social structure that is completely tied to these buildings,” Hallak says. Amen, sister. Those ocean views won’t even exist once the whole town is paved with high-rise towers because they’ll obscure each others panoramas, so it’s really it’s in everyone’s interest to preserve Beirut’s distinctive architectural personality. 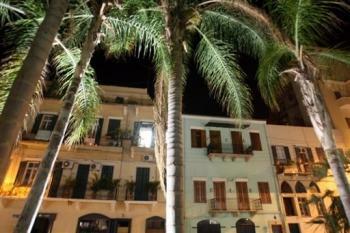 Besides, Beirut has been through the wringer, bombed and bullet-riddled and every other violence under the sun. How monstruous to think of its famous beauty having survived all that only to be destroyed by a real estate bubble. The Museum of London and The Times have collaborated to bring us a most delicious weekend-waster: an interactive map of London with skulls pinpointing the exact location of tens of thousands of buried skeletons found during construction and often reinterred. Zoom in to see who was caught dead underneath a specific street, or just browse around the town, clicking on the skulls to read about the remains found on that spot. There are some great ones. Another skeleton was found with a metal spike lodged in its spine. Its owner, a man who was buried in Smithfield, East London, in about 1350, was probably hit with an arrow or spear, but the attack did not kill him. He survived only to catch bubonic plague in his late thirties or early forties. “Somehow the injury didn’t cause an infection,” Mr White said. “The body has reacted by building bone around the projectile. He survived for months or possibly years. He was found in a large plot of land set aside for burying victims of the Black Death.” It is not known why the man was attacked, but it is thought that he may have been a soldier in the Hundred Years War. Such a burn, surviving a spear in the spine in the Hundred Years War only to die of plague along with a good third of the rest of Europe. The syphilitic, insane prostitute with rotten teeth and rickets from having been kept out of sunlight in childhood is a tragic figure of Hugoean proportion as well. I can’t help but wonder how much business she did, what with the deformed bones, decaying mouth and suppurating syphilis sores. There’s a neat article in the Guardian with wonderful pictures and descriptions of the rooms in which some well-known British writers past and present have put pen to paper (or finger to keyboard). 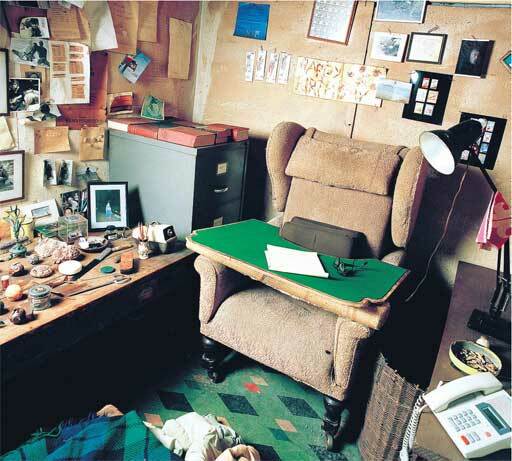 Roald Dahl’s raggedy little shack brought a tear to my eye, because on the walls you can see letters from schools and fans that he saved for years. I sent him a letter when I was in 5th grade and got the most wonderful personal reply from him. The 5th grade students the year after wrote him when the teacher was reading “The Witches”, and he answered them too. 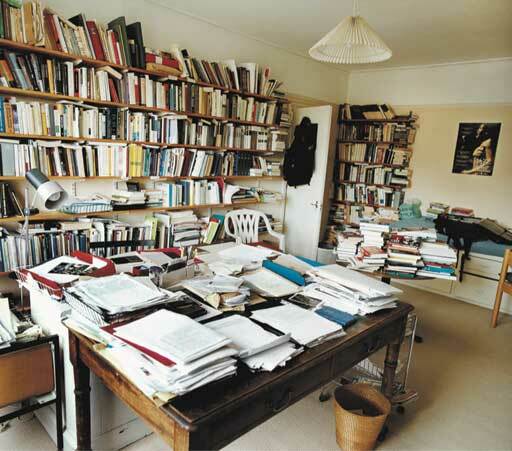 Historian Eric Hobsbawm’s room is another favorite of mine. It’s layered in books and papers, and Hobsbawm’s description is endearing as hell. Some of the shelves visible on the picture behind the two desks contain books on subjects I still work on: nationalism, the history of banditry. Most of them, however, are filled with the foreign editions of my books. Their numbers amaze and please me and they still keep coming as new titles are translated and some fresh vernacular markets – Hindi, Vietnamese – open up. As I can’t read most of them, they serve no purpose other than as a bibliographic record and, in moments of discouragement, as a reminder that an old cosmopolitan has not entirely failed in 50 years of trying to communicate history to the world’s readers. And as an encouragement to go on while I still can. No lamp post, no peace! 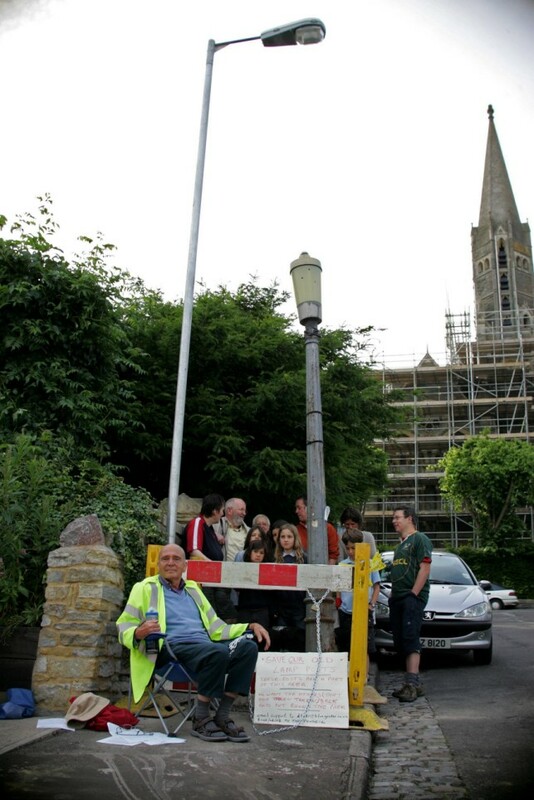 A retired archaeologist in Bristol chained himself to a Victorian lamp post Tuesday, and went on a hunger strike to keep the city from digging it up and moving it to a posher part of town. They’d already taken 17 of the cast iron lamp posts, so with only 13 left, David Cemlyn felt he had to take a stand. ‘The lamp-posts have been here for over 100 years and have been part of what makes a community, along with the red pillar boxes, the railings and the park benches,’ he said. ‘Taking them away is destroying the ambience of the area and it’s breaking down the community. The city council claimed the hundred-year-old lamps were being replaced by modern ugly ones to help prevent crime and to comply with environmental standards, although how the poor, benighted residents of the beautiful and historic Clifton district with its endless Georgian terraces are meant to cope with the despoliation of their environment and dizzying spike in roadside crime rates inherent in the lamp posts, the council didn’t mention. The protest worked. By the end of the day, the council suspended the lamp post looting and agreed to talk it over further with the community. It must be all the smoking. Either that or the convenience of its riverbank location. An area about the size of a football field on the south-western edge of the city, close to the banks of the river Seine, has yielded thousands of flint arrowheads and fragments of animal bone. The site, between the Paris ring road and the city’s helicopter port, is believed by archaeologists to have been used, nearly 10,000 years ago, as a kind of sorting and finishing station for flint pebbles washed up on the banks of the river. Once the dig is complete, the site will be occupied by a plant for sorting and recycling the refuse generated by the two million Parisians of the 21st century. No doubt. Someone should make a black and white movie about it characterized by a syncopated these-antithese of staccato emotional outbursts and existential ennui. My sudden affinity for stale old French stereotypes aside, not only is this find cool because it tells us people have been puttering about Paris for 3000 years longer than we realized, but also because it’s the result of a government program of “preventive archaeology”, where building sites are investigated thoroughly by archaeologists before the builders start. The Emory family settled in Maryland in the 1660’s and pretty much kept every scrap of paper from then until World War II. This huge cache of documents mouldered in the attic of their estate, Poplar Grove, until this spring, when Washington College students began going through them all. 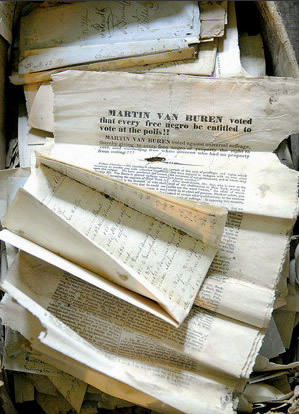 There are all kinds of papers in that attic, everything from sales receipts to letters to posters, including one trashing Martin Van Buren for voting to give every free black man the vote. Goodheart is working with state archivists and a crew of four student interns to collect the documents, which were found stuffed into boxes, barrels and peach baskets. The documents include maps, letters, financial records, political posters, even a lock of hair from a letter dated Valentine’s Day, 1801. There’s a love poem from the 1830s (in which a young man graphically tells his sweetheart what he’d do if he sneaked into her room on a winter’s night), along with war accounts and bills of sale from slaves and crops. The Civil War era documents illustrate the sad veracity of the brother-against-brother cliché. One son fought for the Union, the other for the Confederacy. You can follow the researchers as they delve into this hoard of social history on their blog. They’ve just unveiled a War of 1812 roster in perfect condition from a week after the British torched the White House. First Syria, now Jordan. 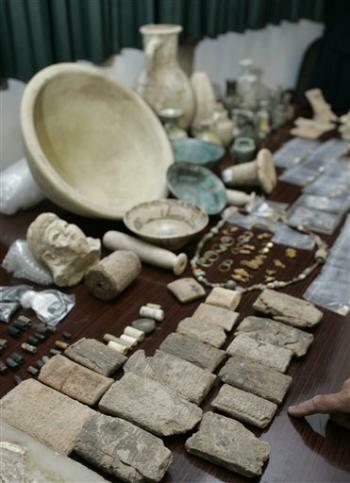 Jordan has Syria beat by almost 1800 or so looted artifacts intercepted at the border with Iraq. In the chaos following the U.S.-led invasion of Iraq in 2003, looters snatched some 15,000 priceless artifacts and smuggled them out of the country. In the last few months, Jordanian authorities seized 2,466 items as they were being taken across the border. Samples of the silver coins, necklaces, ancient Sumerian scrolls, ceramic pots and other artifacts were displayed for journalists during a brief ceremony at the Jordanian Antiquities Department in Amman. Iraq’s acting state minister of tourism and archaeology, Mohammed Abbas al-Oreibi, told reporters the recovered antiquities will be packed and sent back to Iraq in the coming days. Slowly, slowly, the pillaged cultural patrimony of Iraq is coming home. I wish Iraq’s archaeological sites were getting the protection they so desperately need as well, and it would be nice if the museum were fully repaired and operational, but still, repatriation of stolen antiquities is great to see. Two years ago, a diver came across a huge field of 500 amphorae on the seabed, still arranged in the shape of a hull off the southern coast of Cyprus. The authorities kept the find quiet to protect it from looters and the ship itself along with an estimated 300 other amphorae buried in the sand has yet to be excavated, but an international collaboration of scientists and archaeologists have now examined some of the vessels and found evidence of all kinds of goodies, like herb-infused olive oil and retsina wine. There is little doubt the first amphora contained the herb-infused olive oil, which was likely used to dress and flavor meals. The scientists suspect the potent antioxidant properties of oregano helped to preserve the mixture over the millennia. As for the second amphora, its DNA signature matched a plant from the Pistacia genus. That points to either pistachio nuts or mastic (scientific name Pistacia lentiscus). Foley said the ancient Greeks were known to have shipped huge containers of nuts. One third-century B.C. wreck, in fact, contained jar after jar of them. 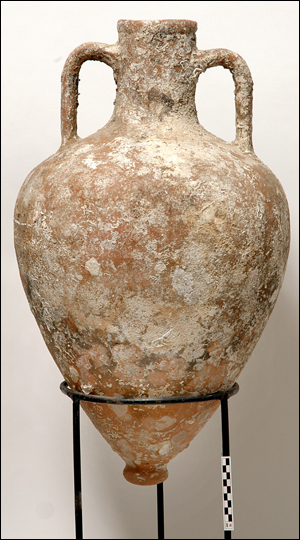 But since the design of this particular amphora was most associated with wine shipments, mastic-flavored wine is the more likely choice. This is a major discovery, the first time DNA has been extracted from a shipwreck. “This (study) opens new possibilities for archaeologists — now perhaps we can figure out what was carried in almost every ’empty’ jar we find in land excavations or shipwrecks,” researcher Brendan Foley of the Woods Hole Oceanographic Institution told Discovery News. “Maybe we can even go back to the amphorae, jars and cooking pots previously excavated and now sitting in museum storerooms around the world and ask new questions of each artifact,” he added. So cool. I hope this starts a run of DNA testing on ancient vessels. Frédéric Chopin, very reasonably considering the era, had a tremendous fear of being buried alived, so much so that he asked that his heart be removed from his body after his death to ensure that he was in fact dead when buried in Paris’ Père Lachaise Cemetery. This dovetailed neatly with his sense of Polish patriotism, so when Chopin died in 1849, his sister had his heart removed and took it back with her to Poland where it has remained all these years, happily preserved in cognac in the Church of the Holy Cross in Warsaw, surviving intact even the near-destruction of the church during the Warsaw uprising in 1944. Now scientists want to examine the heart for DNA evidence of congential illness, specifically Cystic Fibrosis. “From early childhood he was weak, prone to chest infections, wheezing, coughing,” Cichy said. Records show that as an adult weighing 40 kilograms (about 88 pounds) at a height of 1.70 metres (five foot seven inches), Chopin was chronically underweight — another telltale symptom of cystic fibrosis. Cichy also pointed out that despite a passionate romance with flamboyant French writer George Sand, Chopin had no known children, suggesting infertility — another telling clue. And few cystic fibrosis sufferers live past 40. “If we can prove Chopin suffered from cystic fibrosis, it would be a huge inspiration for our patients, especially children, to know they can accomplish a great deal like he did,” Cichy told AFP. There is some opposition to the idea from one of his descendants, and the church hasn’t even been asked yet, but it seems the ultimate decision is in the hands of Poland’s culture ministry. Steven Shaffer, the Ohio historian who removed that big ol’ rock from the Ohio river, has been indicted by a Kentucky grand jury. They’re not kidding around either. The charge is removing an object of antiquity, a felony that could garner him a 1-5 year prison sentence. The divers who helped him fish out the boulder are also being considered for indictment by the grand jury. Shaffer is shocked and appalled at this sore miscarriage of justice. He said there is mounting evidence that the face carving was not done by an Indian and that the rock is therefore not as significant as historians once believed. Perhaps the authorities consider his evaluation credentials are a tad tarnished, what with the theft and all. Seriously, what kind of historian gets his buddies together, rents some wet suits and removes an object he knows is protected? And what kind of stupid, self-defeating response is “eh, it’s just some graffiti on a rock; shouldn’t even be protected anyway”?